M&M Carpet & Tile is a licensed and insured company in Melbourne, Fl, that carries a wide array of name-brand floors and specializes in residential and commercial installation. The company is family owned and operated by the Sickle and Moran family. They bring to the community over 40 years of flooring experience in carpet, hardwood floors, laminate, vinyl tile, tile and other new, innovative styles of flooring; They also offer repair services in all flooring types. Beautiful homes start with beautiful floors. You have the right to expect the highest quality materials for every detail in your home. Here at M&M, we are in the business of flooring. Melbourne. FL is our home base and we’re proud to be the preferred flooring experts for so many businesses and families in the Brevard County area. Your home is one of your most important assets and reflects the lifestyle you and your family lead. When it comes to floors, whether you want hardwood, tile, laminate or marble, we are the experts. At M&M Carpet & Tile we feature the latest in floor fashions, with options to complement every home décor. With our competitive pricing and an excellent customer service team, you’ll be pleased with the finished product. In today’s market we understand the need for value and we strive to find the best flooring materials available, for your satisfaction. If you’ve decided it’s time to rejuvenate your home, why not start with the floors? Choose a quality material that not only works well with your décor, but one that feels good underfoot. Home decorating is all about look, beauty and value. We don’t want you to settle for less; we strive to make our customers happy. The majority of our business comes from direct customer referrals; your satisfaction is our business goal. Our team of interior design professionals and custom installers will work with you to find the best materials for your house and handle all aspects of the installation. Make M&M Carpet & Tile your destination for home renovation. With the many options in flooring materials today, it can be difficult to decide on the best match for your home décor. Our experts in interior design can talk with you about the advantages of certain floors, their care requirements and style elements. Together we’ll help you pick the perfect floor for your budget and style preference. 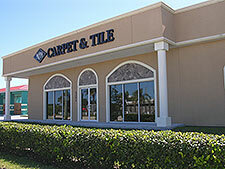 M&M Carpet & Tile is proud to be one of the top flooring design centers and installers in Brevard County. We believe in our products and we believe in offering our clients the best value and the best customer service. As you browse through our gallery of offerings, you’ll see the quality flooring we have to offer. You can also look at the customer success stories we’ve received. We want you to know our reliability and reputation is at stake with every floor we install. If you’re thinking about new flooring, M&M Carpet & Tile is the place to start laying the foundation for your home. Contact us or give our professionals a call and let’s talk about your ideas. © 2014 M & M Tile Warehouse. All Rights Reserved. Website by Tahoe Creative Solutions.